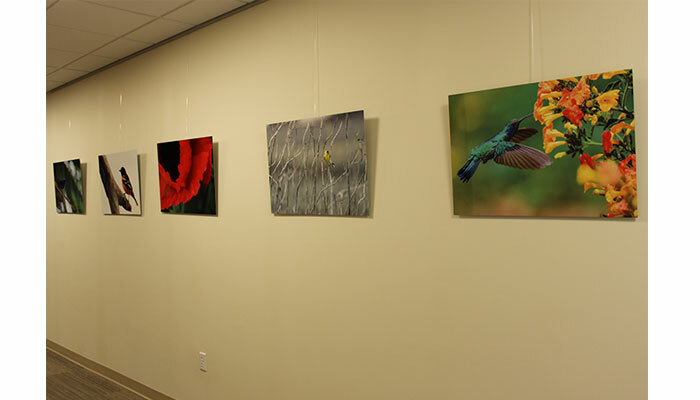 The walls at Greene County Medical Center are beginning to feature pieces by area artists. Malvern, Iowa, artist Zack Jones was commissioned to do a special Greene County work for the medical center. 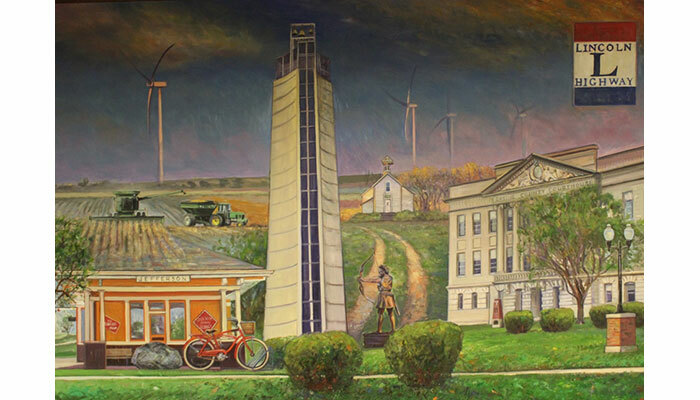 The final piece, measuring 6'x9', is titled "Greene County: Home" and showcases recognizable Greene County landmarks. This piece hangs at the entrance to the outpatient waiting area. Jones spent several days in Greene County, photographing landmarks and asking area residents to share what Greene County meant to them. The final piece depicts all he discovered. Watch artist Zack Jones create "Greene County: Home" in this timelapse video. 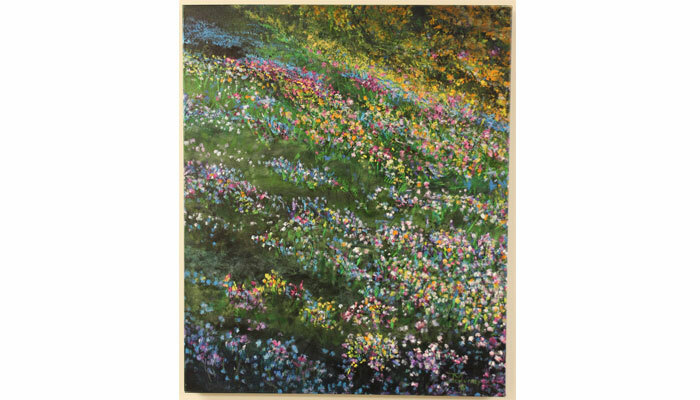 Jones is known for large oil paintings that can be found in the private collection of Creighton University, the Greenbelt Bank in Iowa Falls and many other locations throughout the United States. Jones does most of his work in his studio in Malvern, a renovated 140-year-old church he calls "Project Art Church." Jones' most recent piece was a very large 100' long and 20' high mural on the side of the historical museum building in Oakland, Iowa, completed in late fall 2015. Jefferson, Iowa, native Jamie Daubendiek was first introduced to photography by his grandfather, who always had his film camera out taking pictures throughout Jamie's childhood. From this initial curiosity, Jamie took a class in photography during high school, where he learned the basics. Later, when he was attending Luther College in Decorah, Iowa, he took another photography class and also got his first digital camera. During this same time, Jamie completed courses at the New York Institute of Photography. After college, Jamie moved out to Colorado, and eventually returned to his hometown of Jefferson. Today, Jamie takes photos all over the world as he travels. He is the chief operating officer at Jefferson Telecom - he represents the fifth generation in this family business. Jefferson native and longtime Jefferson-Scranton art teacher Diane Foster was a leading art teacher and artist in the county prior to her death in 2013. Often recognized for her teaching, Foster was selected as Iowa's Outstanding Secondary Art Educator of the year in 1991. It was noted that "Mrs. Foster has made many contributions to the profession of art education in Iowa and the region, through her teaching and her work in state leadership roles within her profession." Foster was also known for her inspiring poetry. As an artist, Foster was known far beyond Greene County. She had both a national and international presence among artists. She had showings locally and as far away as Japan. Her unique style will be familiar to local residents. "She was my art teacher," will also be said by many as they admire her work displayed here. Rural Jefferson resident Joe Murray is a full-time artist with deep roots in Iowa's culture and rural beauty. Originally from northeast Iowa and a graduate of the University of Northern Iowa, Murray found a new love - art. Murray pained for 25 years before he showed his work to the public and it was in 2005 that he became a full-time artist, fulfilling a long held dream. 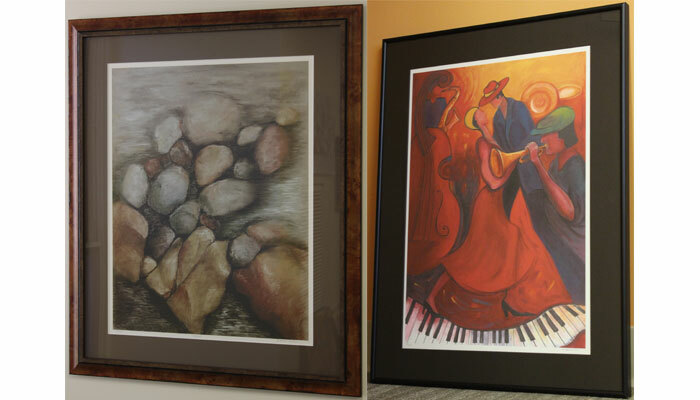 He has shown his work throughout Iowa and has studied with artists in Colorado and New Mexico. A converted horse barn in rural Greene County serves as Wayuga Art Studio (wayuga means "serenity" in the Native American language). His work utilizes watercolor and acrylic paint in separate layers on gallery-wrapped watercolor canvas. Of his work, Murray states, "My images center on rural culture that reflect serenity. 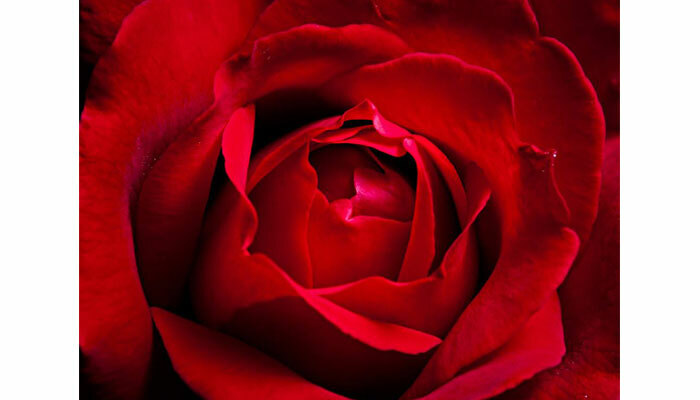 Images that regenerate the soul, reduce stress and encourage relaxation." Scott Fairbairn, a 1985 graduate of Jefferson Community High School, has been taking pictures as long as he can remember. He purchased his first 35mm film camera in 1981. His involvement in photography was intense but sporadic until 2007, when he moved to rural Prairie City, near the Neal Smith National Wildlife Refuge. With such great subject matter close at hand, Scott has used his camera on a near daily basis for the last nine years. While he has always enjoyed photographing wildlife and landscapes, he has lately been gravitating towards making action portraits of athletes, especially dancers. 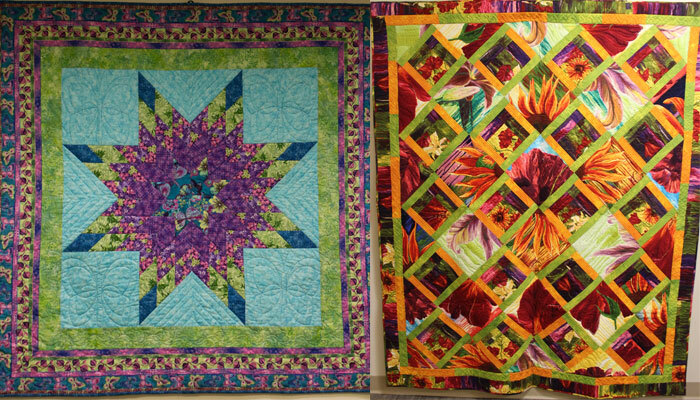 Suzanne Sievers is a familiar name in central Iowa quilting circles. She is owner of The Stitch quilt shop in Jefferson, and has been a quilter for about 15 years. Sievers moved to Jefferson in 1975 to teach vocational home economics in the Jefferson-Scranton school district. After 22 years of teaching she opted to open her own business - Suzanne Sievers Designs - which focused on sweatshirts and tye-dye designs. In 2006 she opened The Stitch, which has gained a reputation as one of central Iowa's finest quilt shops. 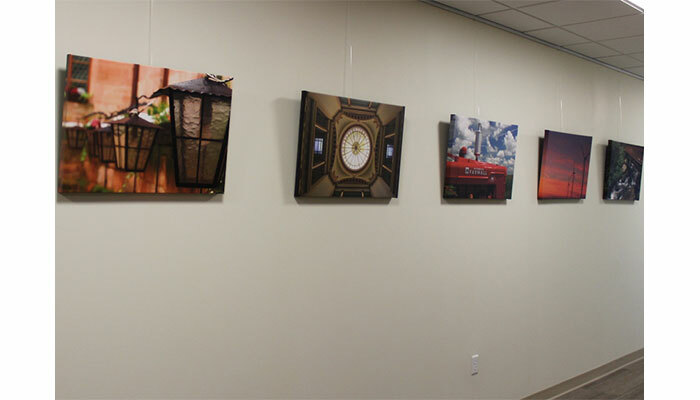 Her quilts, on loan to the medical center, are displayed on rotation in the outpatient lobby. Matt considers his photography "more than photos - more than art - it is stories, messages and inspirations." Eternally curious about his subjects, as well as the craft of fine art photography, he keeps his camera within reach most everywhere he goes. Wetrich, a Jefferson resident for over ten years, is a naturalist for the Carroll County Conservation Board. He serves on the Jefferson City Council and is active in many community events and projects.